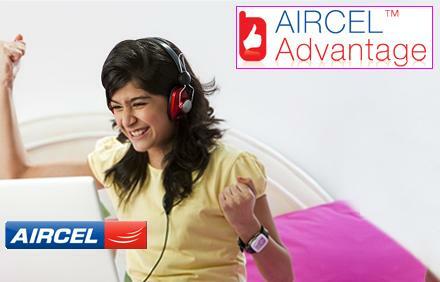 AIRCEL the fast growing Pan India telecom operator in the country in a latest move has now chosen to delight its mobile service users with its customer loyalty rewards program dubbed as “Aircel Advantage”. As a part of Aircel Advantage, you can look forward to special privileges like attractive discounts and offers on a range of products from Apparels to Gadgets, Mobile Phones (Handsets) to Consumer durables, Eating out (Hotel and Restaurants) and various other categories. Invitations to Movie premieres and premium events like IPL matches, Professional Golf Tour of India, Chennai Open, Fashion Week and many more. Aircel Advantage offers membership to its customers who meet the some criteria like customers monthly bill amount/prepaid usage for the past 12 months should be a minimum Rs 400. Along with the above, all the members should have been an Aircel subscriber for atleast one year and have a clear credit history with no barring in the last one year for due date default in payment of bills. The operator also has a dedicated toll free helpline (1800 1030 414) to address “Aircel Advantage” program related queries in a timely manner. Subscriber also can check and redeem your accumulated points against exciting offers from the online gift catalogue, download discount coupons, keep track of upcoming events and much more on Aircel Advantage portal. Thanks to Nidhish Vashisht ! @Ashish so u want to check daily ..refunding means they are doing gimmics man..if u are not aware wat will happen …most of the users illtreated were made to use this services by the retailers(offers they will get from the co.) who is charging daily for 10 RS..these customers are the golden eggs for these cos’raising the ARPU .. I have not interacted with any Delhi user! According to which is the Best & Worst Telecom Operator in terms of network coverage??! In terms of Network coverage in Delhi, the best operator is Airtel (Not in Delhi Only even in entire NCR) and the worst operator i hv seen RGSM. I have also visited UP (W) and I found Idea is the Best operator there, in terms of Network coverage.